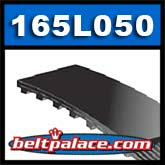 165L050 Bando Industrial Synchro Link Timing Belt. 1/2" Wide - 3/8" (.375"/L) Pitch. 16.5 inch pitch, 44 teeth. 16.5" Length OC.